The island nation of Singapore has become the second government to install a 32" E-ink sign. The Singapore Land Transport Authority has just installed eleven new public transportation information boards at bus stops across the island. The signs are based on the 32" E-ink screen which was revealed at SID Display Week 2014, and incorporate an LED frontlight. The eleven signs are powered by solar panels, and have backup batteries which can keep the displays going from five days up to a week, in the absence of sunlight. They were developed by Visionect and are based on the DIY development kits which Visionect announced back in March. According to Strait Times, an LTA spokesperson said that the 32" signs were more visible than their LED counterparts, and cost less.. Each of new signs costs around $43,000 to install - or about $7,000 less than similarly-sized LED signs. 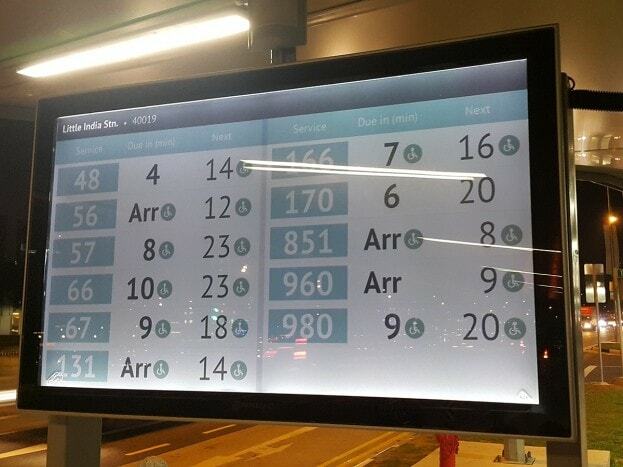 Visionect reports that the LTA is looking to upgrade the info boards at 85 bus stops across Singapore, and depending on how this project works out the LTA could modernize up to 200 bus stops with the new signs in the next few years. P.S. If you're in Singapore, please let me know f you see the signs. Can’t find the signboard in Singapore~ You got the location of the sign board?